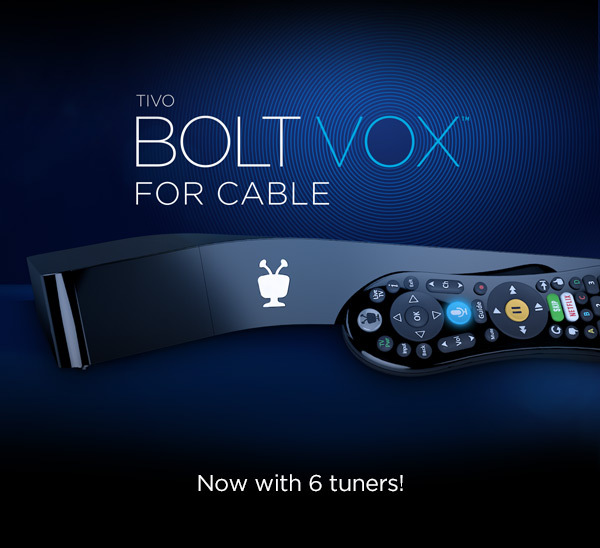 New 6 Tuner TiVo BOLT VOX for cable. The best of cable TV, even better. No more switching inputs or juggling remotes, TiVo BOLT VOX works with your cable service or HD antenna to bring live, recorded and streaming TV together in one powerful 4K-compatible device. Use your voice to easily find, watch and record your favorite shows, launch popular streaming apps and access TiVo's time-saving, fan-favorite features that supercharge your TV experience. Like SkipMode®, which lets you zip past ads with a tap, and OnePass™, which finds every available episode of any series.